Manchester City Football Club ( MCFC ) full size towel - You can choose the yes option to have this MCFC towel personalised with an embroidered name. Manchester City Football Club ( MCFC ) full size towel - You can choose the yes option to have this MCFC towel personalised with an embroidered name. This official Manchester City beach towel is soft velour and would be a great unique gift with a name personalised onto it. This Manchester City FC Body Towel is ideal for the footy fans bathroom, bedroom, at the swimming pool or gym. Manchester City Football Club ( MCFC ) full size towel - You can choose the yes option to have this MCFC towel personalised with an embroidered name. This official Manchester City beach towel is soft velour and would be a great unique gift with a name personalised onto it. 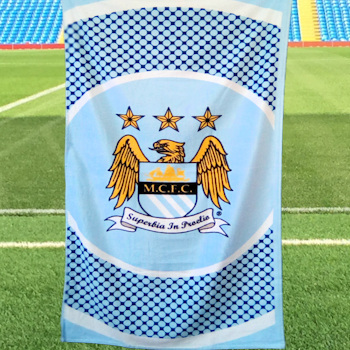 This Manchester City FC Body Towel is ideal for the footy fans bathroom, bedroom, at the swimming pool or gym. 100% cotton velour. Design may differ from that pictured. Amys Gifts can personalise this towel for a small additional charge. Just choose the yes option and fill in what name you would like embroidered. We use the largest lettering for the length of the name we can. We use a coordinating thread colour and position the name so it will not obstruct the main centre picture on the towel (this is usually diagonally across a top corner). A personalised towel makes a great gift with that added unique touch - is also handy for swimming lessons and sports!